I’ve been cloth diapering for over 3 years now and really appreciate All in Two diapers (AI2). AI2s, like the one featured here, are a great cloth diapering option! All the ease of a prefold and shell, but replace the prefold with a snap-in contoured insert and you have an amazing combination that’s easy to care for and use. Work at Home Mom Jamie, from upstate NY, started her diaper business after the birth of her son. As an eco-friendly Mama she knew how important cloth is to the environment. She set to work sewing these AI2 diapers and created Cloth N’ Stuff. 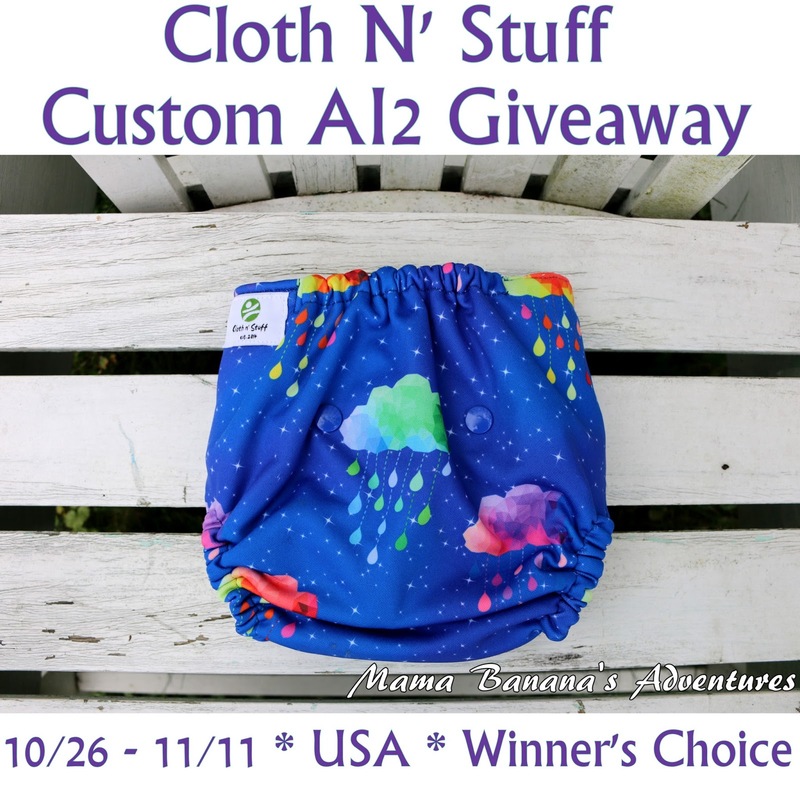 One lucky USA winner will receive a custom AI2 Diaper of their choice! Enter below and make sure to check out Mama Banana’s Cloth N’ Stuff Review for full company details. Thanks for stopping by and good luck in the giveaway! Disclosure; This blog was not compensated for participation and is not responsible for prize fulfillment. This giveaway is no way associated with Facebook, Twitter or other social media channels from which it will be promoted. Questions? Contact MamaBananasAdventures@Gmail.com and as always, have a wonderful day!